It took me awhile to decide which appropriate footwear for an activity I obviously love doing — river trekking, and waterfalling. 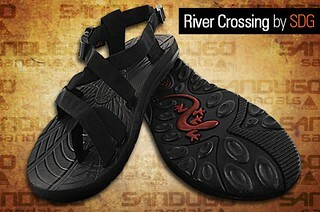 After checking a few on, and offline, Sandugo River Crossing Sandals was a standout. I didn’t need more prodding, I got myself a pair. Background: I have clumsy feet, and I do not trust them at all. Until now, I can never get away without mini accidents mishaps during adventures, and trips. I even trip with slippers on on a paved walkway — that is how clumsy one could get. I have come to work around it — you never let that stop you, if you love something that much. What I needed: Since the activity will require crossing streams, and rivers, I decided an open footwear would do nicely. So I knew it would be best to get me sandals with sole grip fit for any terrain, and snug fit even on incline or declining slopes. I hate it when there is not enough support, and hold that my feet slips out of the anterior of the footwear. Sandugo sandals are originally created for demanding activities that requires trekking in different terrains. Their line of sandals have become the brand’s best example of its extreme toughness and reliability. The Sandugo River Crossing Sandals is an all terrain sandal that was designed with having to get your feet wet along the trail. It is one of traditional design but innovative features. A 1 week replacement warranty, and 3 months service warranty is guaranteed for this product. Toe-strap design helps prevent the feet from sliding off at the anterior portion of the footwear — especially when going downhill/stream. continuous & adjustable straps for easy fitting. The outsole is contoured like the sole of our feet is, and it grips surface too. The arch support is comfortable. What I did not like about it:~ After trekking for a while, the topsole’s surface kinda give my soles discomfort from the surface friction. I sometimes wash my feet in water to relieve the discomfort, lessens the dryness, and wash away dusts. Wrong move, I know, but I could not help it. My friends say my soles need callus. Toinks! Expect my friends to be so not helpful at all. ~ The anterior portion, where the toes rest, is wide. It does help in protecting my toes, and adding surface hold specially on footholds, but sadly, I nearly tripped (3 times) on that feature. My gait patterns are okay, but there seem to be something wrong with — my feet, and their ability to trip, slip, and get me in trouble. 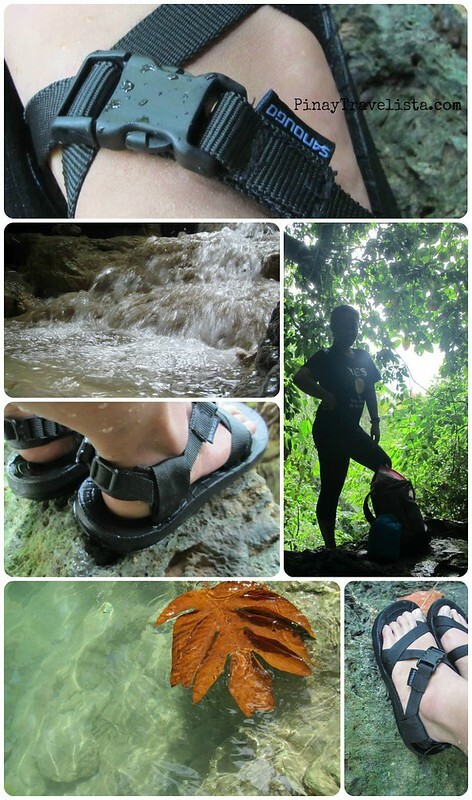 Despite me slipping (only once) with these on, the Sandugo River Crossing Sandals, and I survived the Waterfalling Adventure Tour 1.0 by Iligan Bloggers Society, Inc. It has been my constant companion for outdoors of this type since. Much as I have natural cushion behind there, I do not want my accident-prone nature be the reason for any future medical condition. So expect, still, to see me take off any footwear, get nearest to the ground when I think any accident is bound to happen. A cliche,” better be safe than sorry” still fits this one. How about you, what do you require for outdoor footwear? Disclaimer: A non-sponsored review for Sandugo Sandals: Sandugo River Crossing Sandals.